This Hallowe’en, the ghosts of the St. John’s Haunted Hike are going mobile - materializing on wireless devices near you. Storyteller Dale Jarvis has released a version of his popular ghost tour for iPhone and iPad users, just in time for the holiday. The app was created in partnership with St. John’s web designer and developer Levin Mejia, and his company IV & III. 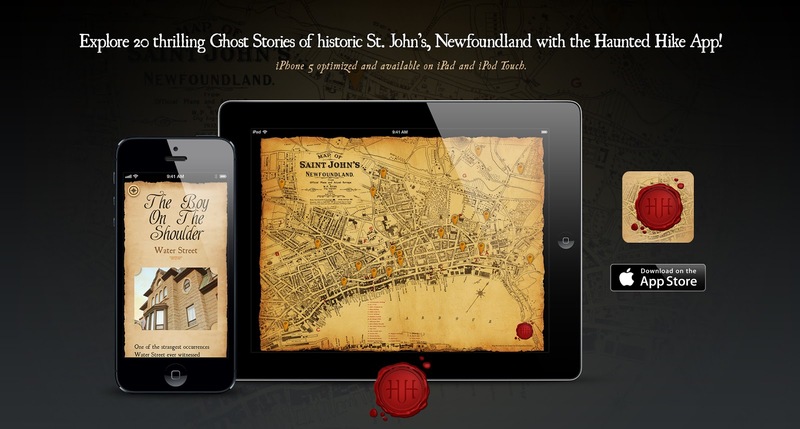 The mobile Haunted Hike application celebrates 20 creepy stories from downtown St. John’s. It features dead soldiers still standing guard, night-time warnings from eerie Victorian ladies, and strange creatures lurking around the shores of a local pond. The app is currently available for download through the iTunes app store. The St. John’s Haunted Hike ghost tour was established by Jarvis in 1997. It regularly sees crowds of tourists exploring the city’s dark twisting streets, listening to ghost stories and learning about the more sinister side of the history of St. John’s. "I wanted to do this app because I thought it would be a great way to turn Dale’s Haunted Hike into something people could enjoy all year round and across the globe,” says Mejia. No stranger to the development of mobile content, Mejia has also produced the Moose Watch app, a real-time location based application bringing awareness to moose sightings on Newfoundland and Labrador roads and highways.